We can never quite get over the shift from the witches, ghosts and goblins of Hallowe’en to the sombre thoughts that come to mind as Remembrance Day approaches. 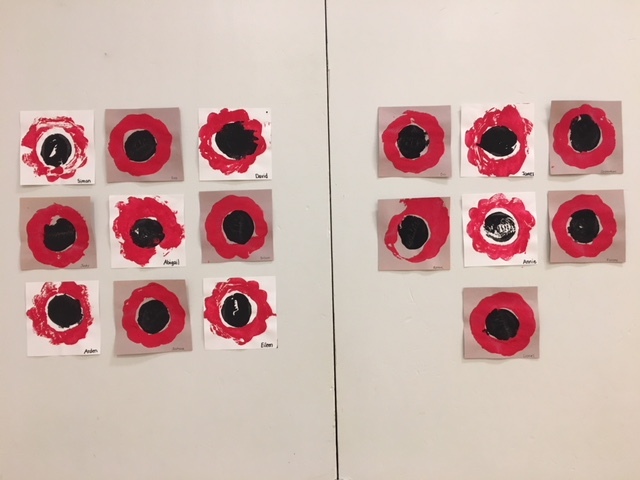 Here in the Kindergarten, the orange paint barely finished drying on our jack-o-lanterns when the black and red acrylics were hauled out to make our Poppy prints. Ah…such is school life. Despite holidays and special days, Christy and I still manage to keep the alphabet train moving along. 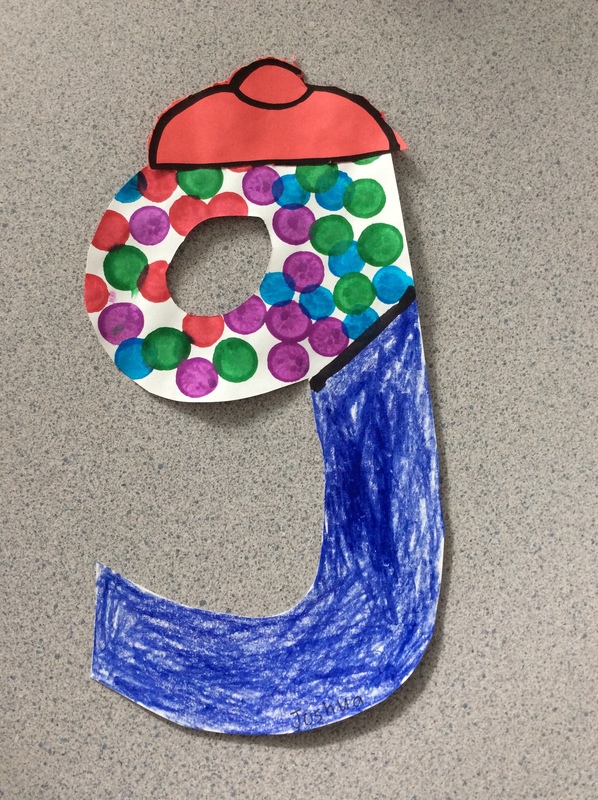 We’re always looking for new ideas for our cute Alphabet crafts and this year we have the most adorable idea for “g” – a gumball machine (courtesy of Pinterest, of course). We were very excited to make these with our children and they very much enjoyed using the Bingo markers to make the gumballs. We have an exciting new event to add to our timetables and that is Kindergarten Singing! The Kindergarten children will have a six week module of an additional singing class with Mrs. Soderling, our Music Teacher. We had our first session this week and our children sang very beautifully. They’ll be showing you everything they learned at the Christmas Concert in mid-December. Our Boho Birds were returned to us from The Card Project. You will have received your complimentary card with your child’s artwork. The children’s original work is now hanging in our classroom. Please feel free to come by anytime to see it. 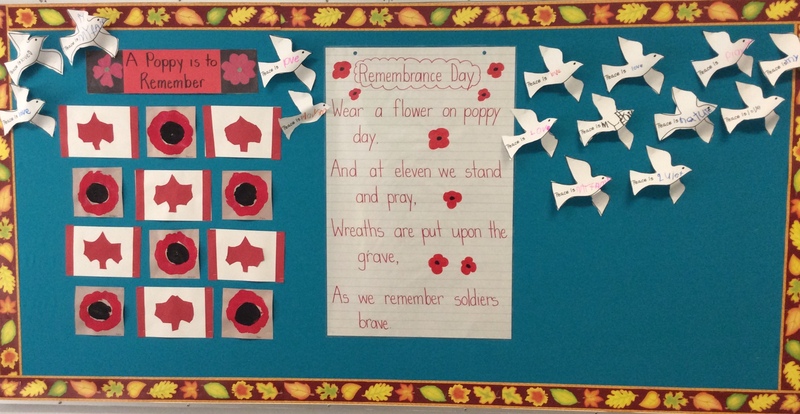 We had quite a lot of preparation for Remembrance Day this week. We made the aforementioned Poppies using an acorn squash and potato as our block for printing making. The children were fascinated with the insides of the acorn squash (“Hey, that’s just like a pumpkin!”) and the mass of a relatively small object. We practised out cutting and pasting skills cutting out these small maple leaves to each make a Canada flag. 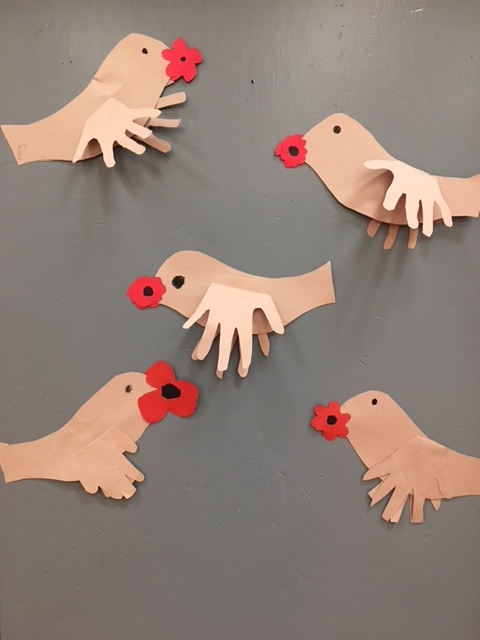 We contributed half of our Art collection to the Remembrance Day Assembly and made these lovely displays. 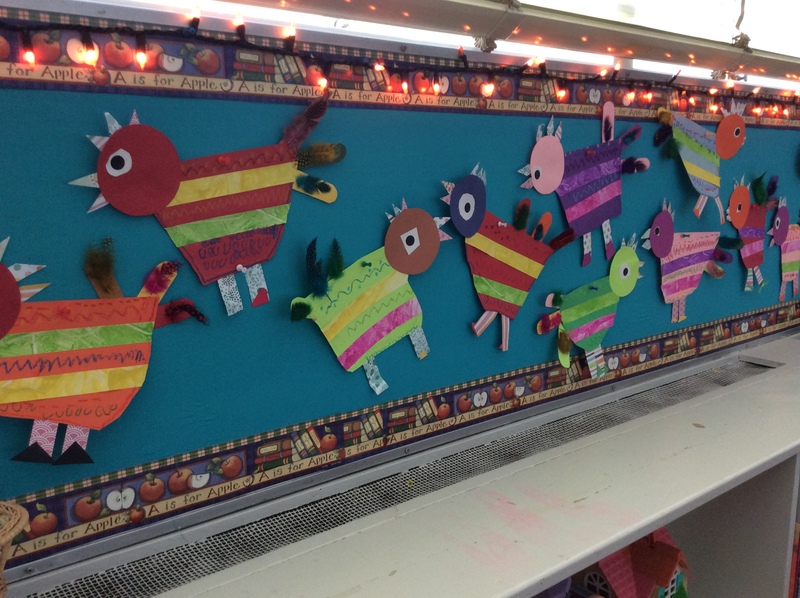 Following the ceremony we will add the children’s artwork to the classroom bulletin boards. We used these ideas to each make a page to contribute to a class big book. It’s at times like this we are reminded that peace begins at home, in the hearts and minds of our little students. 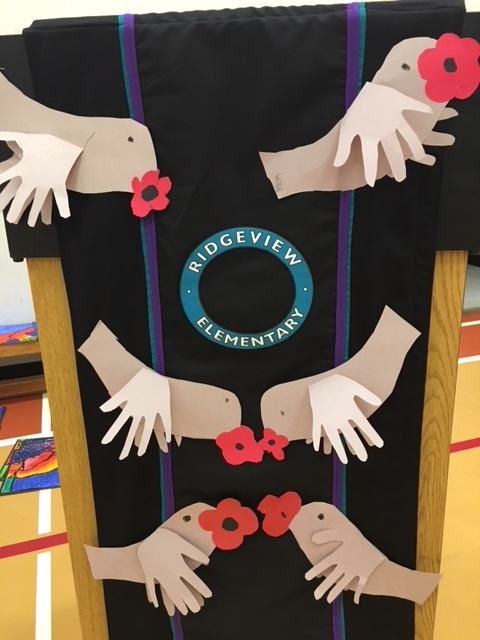 We’ve had two Assemblies now, but the Remembrance Day Assembly is a very serious and solemn one. Students are asked to enter the gym in silence, there is no talking nor clapping following any of the performances and presentations. We all listened quietly to the “Last Post” and stood still for the one minute of silence. Then we listened again to the “Reveille”. You can imagine our thoughts as Kindergarten teachers as we go over the expected behaviour with our children before leaving the classroom. This Assembly is a marker for us in how well we’ve been teaching and practising the self-regulation strategies. Does the deep breathing really help? Will the children remember to do a calming countdown if necessary? Will the children read correctly their social situation and respond appropriately? And they do. Our children were exceptionally well-behaved and remembered on purpose everything they had been taught. They listened well, used their eyes to reference their peers and paid attention to the cues from their social context. We’re always so proud of our classes. We set our expectations high and they consistently rise to the challenge. Please mark your calendars that on the afternoon of Thursday, November 15th we will be conducting a student release drill. There will be staggered pick up times starting at 1:45pm for Grades K-2, 2:10pm for Grades 3-4, and 2:30pm for Grades 5-7. More information will be sent out closer to this date. Please note that it is important that you bring photo ID with you when you pick up your child and/or a child you are listed as a designated alternate. Save the Date: Our Christmas Concert will be on Thursday, December 13. We have a matinee and an evening performance. Information on what to wear will follow soon.